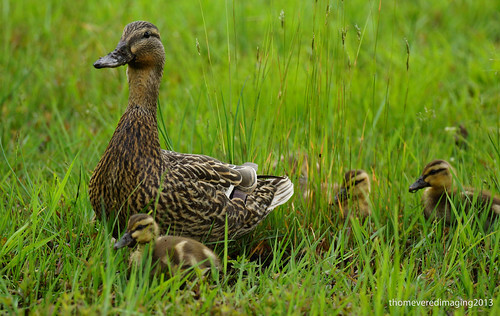 Mallard Family, a photo by thomevered on Flickr. A few weeks ago while walking to have my morning beverage, I noticed an older woman walking down the middle of Quebec Street. At first, I wasn't surprised. Then I realized why she was looking down so intently while she walked and had put her safety in harms way. She was calmly acting as a crossing guard for a Mama duck and her ducklings! Big trucks, city buses all quietly paused while the family cleared Quebec Street and made their way down Baker Street. I wonder if they were escorted all the way down to the river. Bravo to the protector of the Mallard Family and thanks for the warm and fuzzy feeling she gave all of us who witnessed her act of kindness!